Information about the data maintained by the system, including data flows, data stores, record structures, elements, entities, and messages. Procedural logic and use cases. Data relationships, such as how one data structure is linked to another. Project requirements and final system deliverables. Project management information, such as delivery schedules, achievements, issues that need resolving, and project users. The data dictionary is created by examining and describing the contents of the data flows, data stores, and processes, as illustrated by the figure below. Each data store and data flow should be defined and then expanded to include the details of the elements it contains. The logic of each process should be described using the data flowing into or out of the process. Omissions and other design errors should be noted and resolved. How data dictionaries relate to data flow diagrams. The four data dictionary categories—data flows, data structures, data elements, and data stores—should be developed to promote understanding of the data of the system. Procedural logic is presented in Chapter 9, entities are discussed in Chapter 13, and messages and use cases are presented in Chapters “Understanding and Modeling Organizational Systems” and 10. To illustrate how data dictionary entries are created, we use an example for World’s Trend Catalog Division. 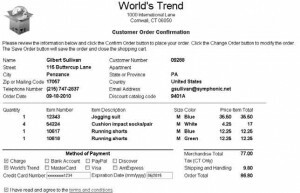 This company sells clothing and other items by mail order using a toll-free phone order system (or faxing the mail order form), and via the Internet using customized Web forms. Regardless of the origin of the order, the underlying data captured by the system are the same for all three methods. The World’s Trend order form shown in the figure below gives some clues about what to enter into a data dictionary. First, you need to capture and store the name, address, and telephone number of the person placing the order. Then you need to address the details of the order: the item description, size, color, price, quantity, and so on. The customer’s method of payment must also be determined. Once you have done this, these data may be stored for future use. This example is used throughout this chapter to illustrate each part of the data dictionary. 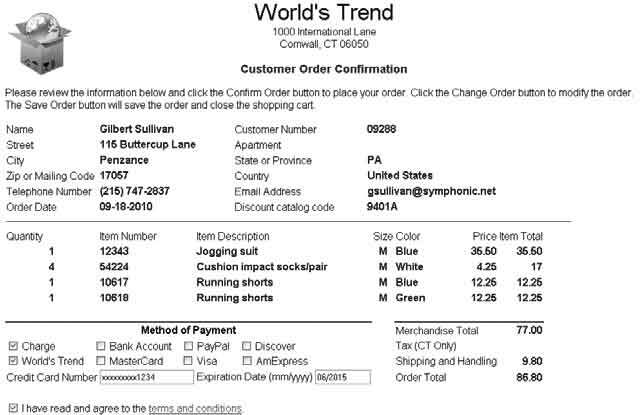 An online order form from World’s Trend Catalog Divison.